So now that you’re all set to make your website presentable to the world and you’ve already finalized the domain name or your website, it’s time to choose from all of the different hosting alternatives. Hosting or web hosting is a type of internet hosting service that allows you to make your website visible to others via the World Wide Web and to do that you need to publish it with a legit web hosting service. 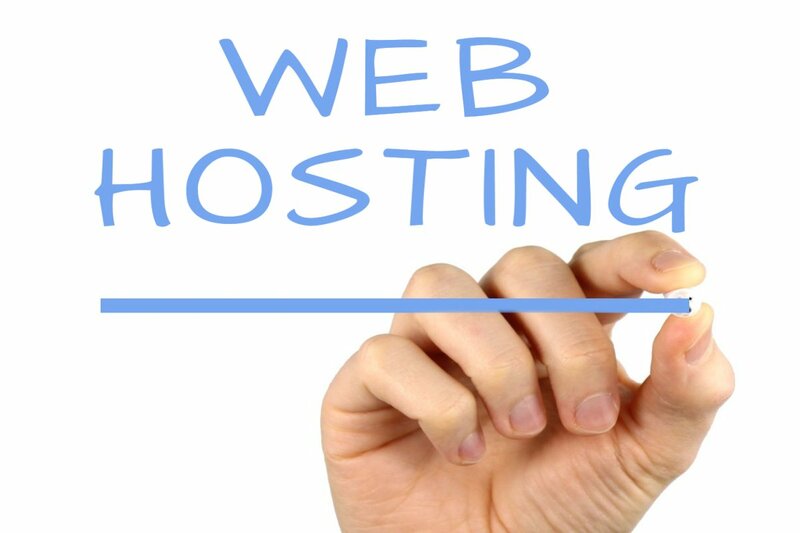 Web hosting is more than just one thing; it’s where your website sits on the internet. Most hosts offer multiple service packages depending on your requirement and budget. There are basically two options to choose from when it comes to web hosting – dedicated hosting and shared hosting. Let’s take a good look at both the options and understand the difference between the two. Dedicated hosting is where only one website from one individual or business gain full control of the entire physical server and all its resources so that the server hosts only your website. You, as a owner, most likely to have access to whole range of facilities that clients or users on shared servers do not have access to. The server is all yours and you’re your own host, so there’s no resource sharing or limitations on the amount of space allocated for content. This allows for faster response time and better security compared to shared hosting. If you’re looking for stability and control, dedicated server is the thing. Shared hosting, as the name suggests, is where one server and the resources located on the server are shared between many clients or websites which makes it a more affordable alternative for first time users looking to establish a Web presence. The upside to a shared server is that it’s cheaper than most of the hosting options available, but the downside is that a shared server can be slowed down by increasing traffic from other websites using the server. A shared server is a good start but if your traffic is likely to increase and you expect it to continue, then you have to look at other options. Shared hosting is the most common and inexpensive web hosting service in which one physical server and the resources located on the server are shared between many clients. It’s a budget friendly way for individuals and businesses to create a web presence. It’s one of the popular options for those building their first websites. Dedicated hosting, as the name suggests, means your website reserves an entire server and all of its resources completely so that the server hosts only your website from your business. In simple terms, dedicated hosting is when only your website is hosted on the server, whereas shared hosting in when you share the server with other clients. Since so many websites share the same physical server in shared hosting each having their own domain name, the amount of space allocated to each website to store their content is limited. The storage space is divided among clients who occupy the same server which also limits the bandwidth and you’re likely to be charged if you surpass the allotted bandwidth limit or exceeds the allotted disk space. With dedicated hosting, the entire server and its resources are strictly reserved for you, so there’s no resource sharing or limitations on disk space or bandwidth for that matter because only your website is hosted on the server. As the server and its resources are shared among several clients or businesses, operating cost and the cost of maintenance are divided among the clients or its users which makes shared hosting the most affordable option when it comes to web hosting. For the first time users or businesses looking to establish their online presence, shared hosting is the ideal option. In dedicated hosting, on the other hand, the cost of maintenance is solely bared by the owner of the server which comparatively costs more. 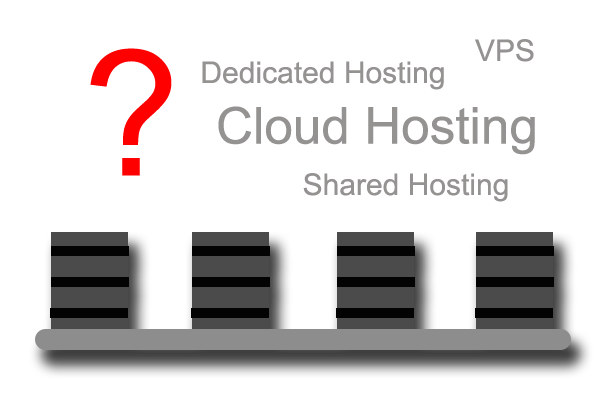 However, with a dedicated server, you get the full control of your hosting environment. Unlike shared hosting, dedicated hosting can be compared to owning a house with the entire space reserved for you meaning the entire physical server is yours to configure and maintain which brings a lot of responsibility. A dedicated server means a strong online presence and strong online presence makes you a prime target for denial of service (DoS) attacks. Plus a dedicated servers allows more flexibility to the customers, the service is prone to malware attacks and data breach. In a shared server, one client can modify the files of another client which immediately poses a security concern. Plus one or many websites who share the server might be vulnerable to attacks which make other websites vulnerable too. If one or more websites in a shared server are involved in some kind of illegal or unethical malpractices like spamming, there’s a high chance that Google or other search engines will block or blacklist the whole IP which in turn affects other websites who share the same server. One bad neighbor can make each and every website on a shared server practically invisible b getting the entire IP blacklisted. A dedicated server, on the other hand, has a very slim chance of being blacklisted because there is only one website who owns the server. Choosing a physical server is one of the most important things one has to consider when trying to establish a strong online presence. Simply building a website is not enough; you need to make your website presentable via the World Wide Web so that the world recognizes your presence. Without any server, your website cannot go public. There are two options to choose from, shared hosting and dedicated hosting, when it comes to web hosting. If you’re a beginner looking to establish a Web presence with as little as possible, shared hosting is the best option for you. But if you want security, control and stability, you might want to go for dedicated hosting. Sagar Khillar. "Difference Between Dedicated Hosting and Shared Hosting." DifferenceBetween.net. 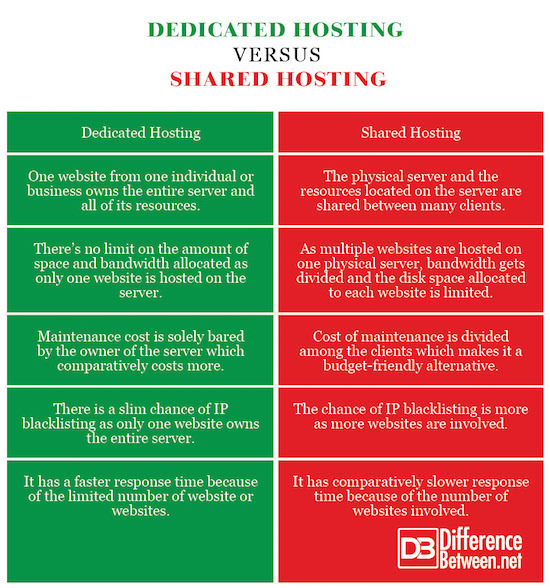 July 23, 2018 < http://www.differencebetween.net/technology/difference-between-dedicated-hosting-and-shared-hosting/ >.